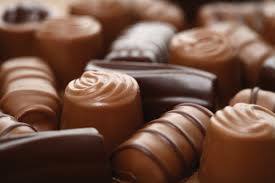 ﻿ Chocolate poisoning is caused by theobromine a naturally occurring stimulant found in chocolate and cocoa. Pets are unable to metabolize theobromine quickly; therefore, pets are more susceptible to the toxic effect as compared to humans. Theobromine stays in the body for an extended period of time and can lead to death. Poisoning occurs most often in dogs; cats seem to be less likely affected, but cases are reported. Symptoms of chocolate poisoning include vomiting, diarrhea, abdominal pain, excitability, hyper activity, salivation, increased water consumption, muscle tremors, increased heart rate, seizures, and death. Symptoms usually occur within four hours of ingestion. In rare cases owners have noted the first symptoms as late as twenty-four hours after the pet ate the chocolate. The first step in treatment is to eliminate the poison by inducing vomiting. Your pet should be brought to your veterinarian as soon as you discover they have eaten chocolate. There is no antidote for chocolate poisoning. If your pet has overdosed on chocolate, your veterinarian will treat the symptoms to stabilize his condition with intravenous fluids and medications. This will allow time for the body to metabolize and flush the theobromine from his system. Different types of chocolate contain varying amounts of theobromine, and ALL are harmful and life threatening to your pet. The safest way to avoid chocolate poisoning is to not encourage a sweet tooth and keep ALL candy and desserts secured away from pets. Don't forget “Death by Chocolate” really happens! *To induce vomiting administer 1 tablespoon hydrogen peroxide orally for small pets every 10 minutes, or 2 tablespoons for large pets every 10 minutes until vomiting begins.